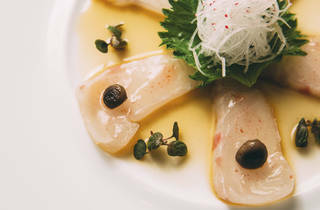 Walking back through Intro to Naoki Sushi feels like navigating a secret passageway to tender sushi and thoughtful dishes. 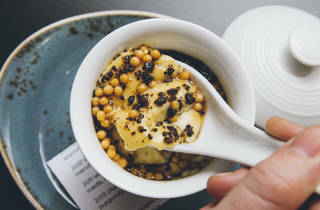 Unlike its sister restaurant, Naoki offers a more laid-back atmosphere that still feels high-end—but maybe not so posh—and complements that with candid, savvy servers. 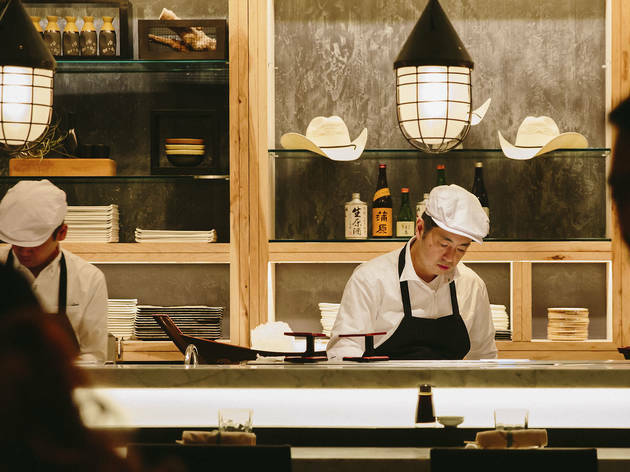 Hidden behind the kitchen of Rich Melman’s Intro, the warmly lit sushi bar is the latest project from Naoki Nakashima (who also runs the sushi program at Shaw’s). 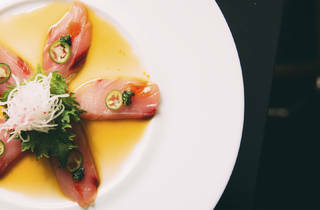 Whether you’re a sushi veteran or just starting to explore dishes beyond tuna rolls, Naoki Sushi offers familiar items and interesting, original plates. 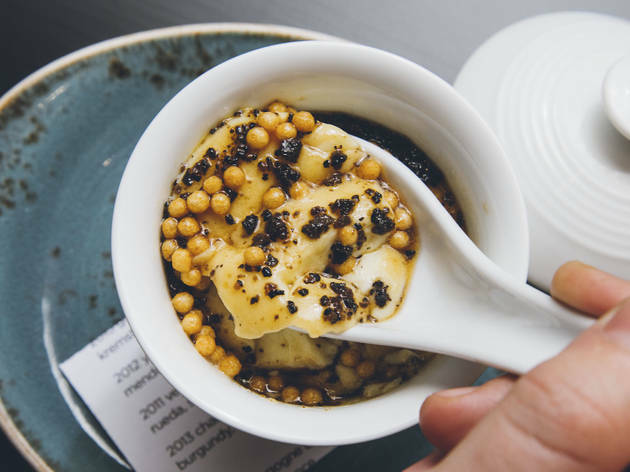 Before diving into the sushi, the appetizers are a must, ranging from traditional to fun—like addictive tuna tacos made with crisp wonton shells and truffle chawanmushi, an egg custard with a dashi broth. 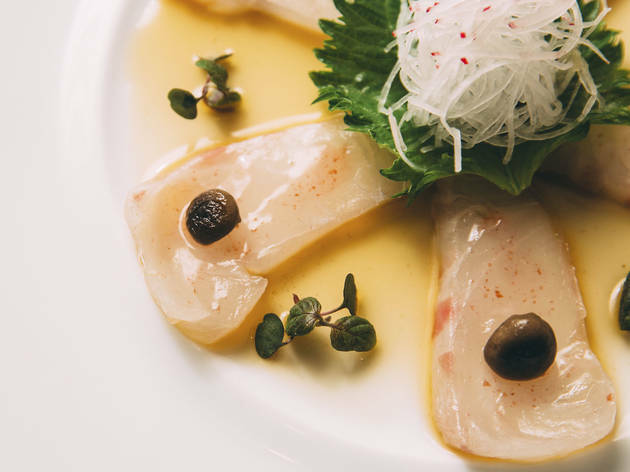 You can’t go wrong by following your servers’ recommendations for the rotating sashimi and nigiri specials. On my visit, options included a slightly sweet and tender kinmedai topped with dehydrated yuzu lemon, to complement the fish. A melting salmon nigiri crowned with smoked soy and shallot is a great choice in the classic nigiri section. While the maki provide heartier portions, it’s easy to stick to nigiri and sashimi. 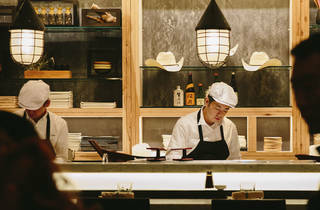 Still, ordering the fatty yet delicate hamachi maki with scallion, cucumber and yuzu is anything but a miss. If there’s one thing to skip on the menu, it’s the main course—the seabass, while tender and buttery with soft bok choy, is too heavy next to a menu of light fish. But you were here for sushi anyways, right? Naoki offers good sushi at a price that’s perfect for a nice dinner (okay, maybe a very nice dinner) catering to those who want to spread their wings a bit and try more than the usual tuna and salmon—for that alone, it’s worth a visit. 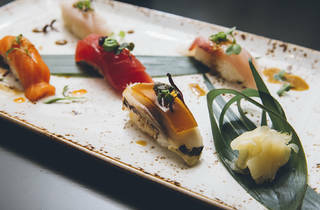 Nakashima’s Naoki Sushi offers more than interesting plays on sushi accompanied by pretty presentations—it’s a fun dining experience without pretension that still delivers an upscale meal. Atmosphere: The space is dim and the light that exists is warm and yellow, similar to its sister, Intro. It boasts a more relaxed atmosphere, less upscale and more approachable. 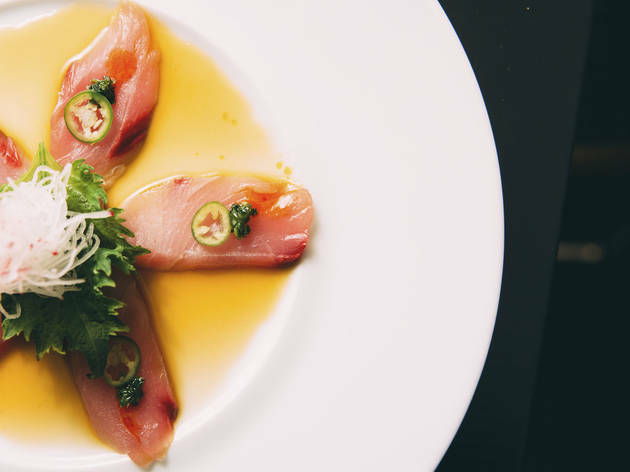 Don’t feel like you need to arrive knowing everything about sushi. 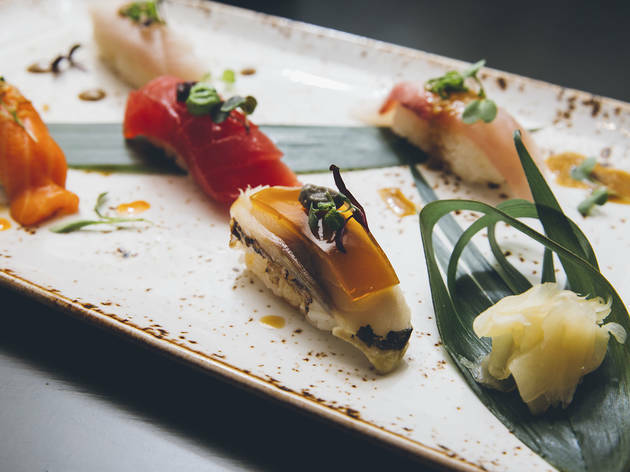 What to eat: The daily nigiri are a must, as are the fun tuna tacos. What to drink: There’s a small cocktail menu and an extensive wine list. If you’re into a cocktail, the Six Corner Sling is a fantastic take on a Last Word, with green chartreuse and rye instead of gin. 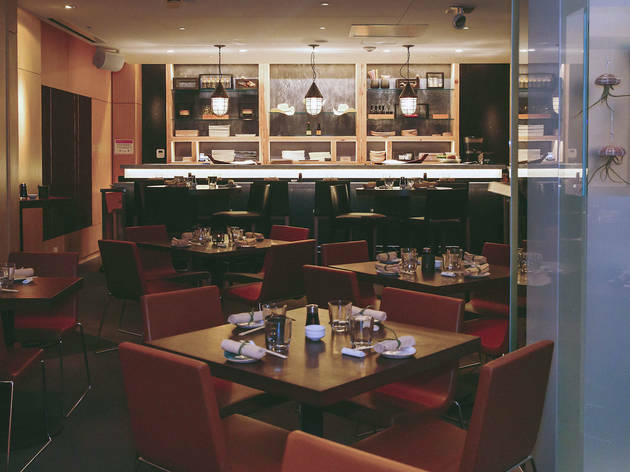 Where to sit: If you can, sit at the sushi bar for a more immersive experience. The two-tops near the bar are great for more intimate dinners and the back of the restaurant can easily accommodate groups of up to six people in booths. Bus: 22, 36, 151, 156. The space is very unique and interesting. You walk through a bustling kitchen into a small back room. It gives off a speakeasy vibe. I had high expectations given the price and its relationship with the Lettuce Entertain You family. The food delivered. 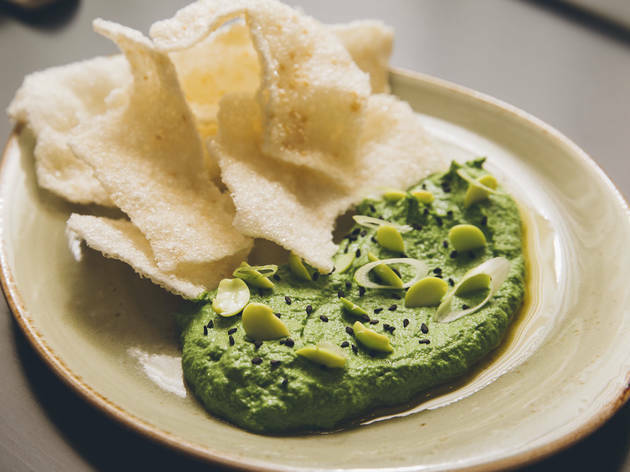 I highly recommend the edamame "guac" dip. 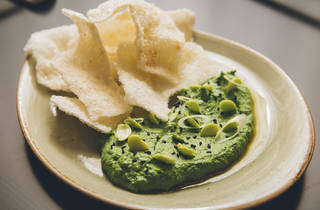 It is the most interesting take on guacamole that I have seen in years. I also enjoyed the classics, like the spicy tuna handroll. We ended with the cheesecake brûlée which had a carmel-ly, smooth flavor. I definitely recommend Naoki, but be prepared to spend a lot. This is the place you go to for an impressive meal, a fancy date night, a "treat yourself" girls night, or an intimate birthday celebration. Nested inside a beautiful hotel, hidden behind a working kitchen that a host takes you through to get to your seat, dark and mysterious, the ambiance and feel of this place all sets itself up for quiet elegance. We had a small group of girls there for a holiday sushi meal and feasted our eyes on platters of sashimi, both from the special naoki-style, and the regular sashimi menu - the salmon, tuna, and hirame were all exceptional. The "edamame" guac dip and the hand rolls were also worth every penny and fingerlick. I know its not classy to lick your fingers, but you do not want one piece of rice wasted at this place. Beautiful, delicious, and an overall pleasant experience. Plus you can hang out in the hotel lobby after if it's tool cold to venture back outside. Which in Chicago December, it is. Upon walking into the restaurant, we were taken through the kitchen, so that got us extra excited for our meal. Once we sat down, it took us a while to figure out the menu and decide what we want. The drink menu is excellent. We ended up trying 3 of the drinks. My favorite was the gin & guava. The waitress was extremely helpful. We got the scallop sashimi, chutoro sashimi, hamachi roll, miyabi dai sashimi, salmon sashimi and a few other items. The chef's special salmon sashimi was my favorite dish from the menu. Overall, this place did not live up to my standards especially considering how great the food was at Intro. 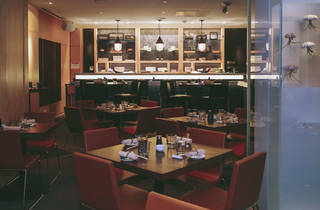 Ambiance is casual, and there's also seating at the sushi bar. The best seats seem to be the 3 booths at the back of the restaurant.